The question most people have is, “What is marine aquaculture?” Most people are familiar with land-based farms for beef, poultry, and produce, but farming in the marine environment tends to be an abstract idea that is hard for them to wrap their heads around. Research has shown that the public has a hard time comprehending more abstract ideas like climate change and GMOs. At the moment, marine aquaculture also falls into that category for most people. It doesn’t have to be that way. There are a lot of opportunities to make the public more familiar with responsible marine aquaculture, but we have to work together! The keys are: more visuals and compelling stories from the farmers and scientists who work in aquaculture and more consistent messaging of accurate information across stakeholder groups. As a community, we need to do a better job of collaborating to celebrate and share the positive stories and learn from and be honest and transparent about the negative stories. There are also several U.S. and international initiatives underway to facilitate more collaboration in this area. More information about these initiatives will be presented at Aquaculture 2019 in New Orleans, Louisiana. The Aquarium’s Seafood for the Future program has begun to chip away at the storytelling aspect through a series of programs and exhibits. In our latest project, we collaborated with U.S. farmers, chefs, and scientists to produce a short video series, titled Ocean to Table: Stories of Food, Farming, and Conservation. The series was narrated by Chef Barton Seaver and co-created with Michael B. Rust at NOAA Fisheries Office of Aquaculture. It was designed to humanize the farmers and scientists, introduce the public to the different types of marine aquaculture we have in the U.S., and demystify preparing and cooking seafood. Funding was provided by NOAA’s University of Southern California Sea Grant and the Aquarium of the Pacific. The full series is available here. GAA: Why does it make sense for an aquarium to get involved in the aquaculture conversation? 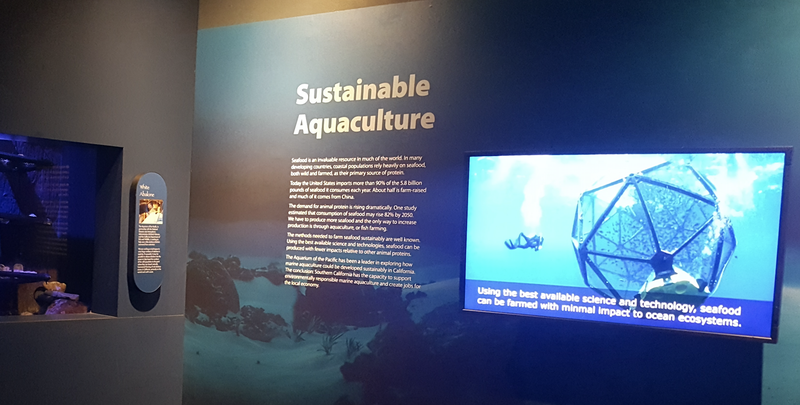 The Aquarium of the Pacific is an ocean conservation organization, and we support marine aquaculture because, done responsibly, it is an important conservation tool. Responsible marine aquaculture will play an increasingly important role in an environmentally and economically sustainable food supply. It can increase the amount of nutritious food for the growing population while reducing impacts on freshwater and land resources. Marine aquaculture can also provide ecosystem benefits, such as cleaning the water column, providing habitat, protecting shorelines, and mitigating ocean acidification. Just like with land-based farming, there are good actors and bad actors, but the body of science, technology, and knowledge of best practices to farm responsibly in the marine environment is strong. We recognize that the risk is not zero, but the benefits outweigh the risks when the operations are well-managed and the operators are responsible. Responsible marine aquaculture should complement well-managed wild-capture fisheries and responsible agriculture to support healthy ocean ecosystems and communities for generations to come. Kimberly Thompson is the Program Manager for Seafood for the Future at the Aquarium of the Pacific and Jerry R. Schubel is President and CEO of Aquarium of the Pacific.